Please find here a link to the Northampton 2013 Preliminary Meeting ProgramClick Here. For the paper version of the Registration Form, please Click Here. Although the rooms at the Hotel Northampton have now filled up the Hotel Northampton has created a wait list for rooms. Please call the Hotel Northampton to reserve your spot (413) 584-3100. We would also like to announce back-up hotel information to the District membership. Additional rooms have been made available at the nearby Clarion Hotel for Wednesday and Thursday nights for $107.00 per night while rooms are available. Be sure to mention your with "ITE Northeastern". Additional rooms at the Clarion are also available for the standard hotel rate. Please note that we are only able to guarantee rooms and rates at the overflow hotel through April 30th so please book soon! Please note that the Clarion Hotel is approximately 1.1 mile south of the Hotel Northampton along US Route 5. Start your District Annual Meeting with a excellent Synchro workshop. Or if you can't stay for the meeting, you can register for the workshop only. Trafficware will be teaching the course, which will include the two three-hour courses: HCM 2010/Synchro and Calibrating SimTraffic. The workshop will include 6 PDH. Cost for the workshop is $175. To see information pertaining to the Synchro Workshop, please see the SYNCHRO NOTICE. The Northeastern District Annual Meeting has made avaliable several "Companion Programs" for attractions and events around the greater Northampton area and the Pioneer Valley. To see information pertaining to the Companion Programs, please see the COMPANION PROGRAM NOTICE. The Northeastern District Annual Meeting Golf Tournament will be held at Hickory Ridge Golf Club in Amherst, MA on Wednesday May 22nd, 2013. Tee times start at 10:30. For more information, please see the Registration Flyer below. The New England Section Emerging Professionals Group will be sponsoring two events during the NortheasternDistrict Annual Meeting including: a professional development workshop, "Stuff You Don't Learn in Engineering School" as presented by Carl Selinger, and a Downtown Northampton Bar Crawl. To See the EPG Workshop Flyer Click Here. To See the EPG / YPT Bar Crawl Flyer Click Here. 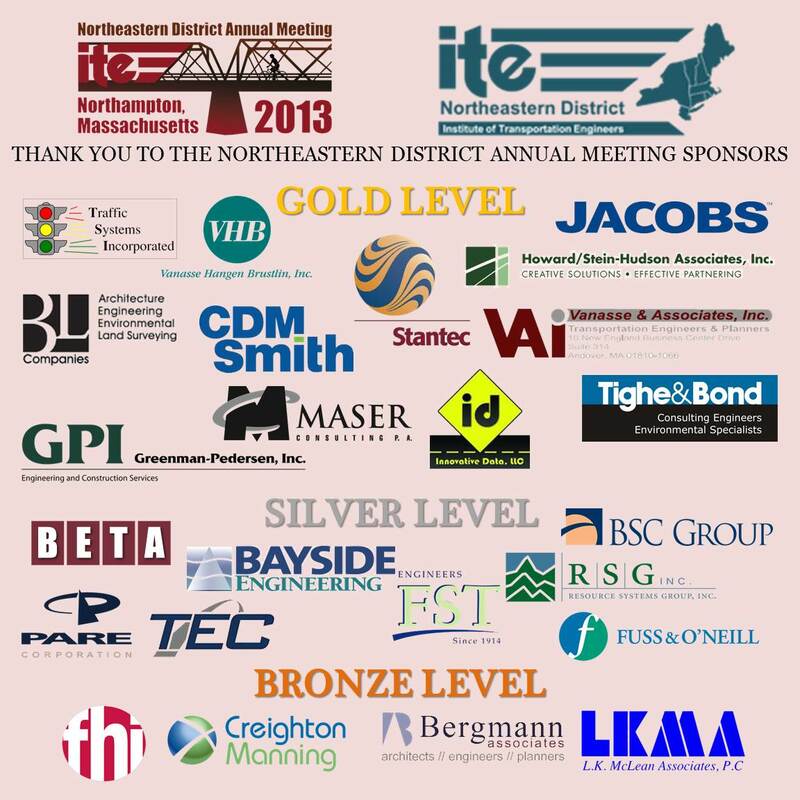 The 2013 ITE Northeastern District Annual Meeting is soliciting Consultant Support from all corners of the ITE Northeastern District. 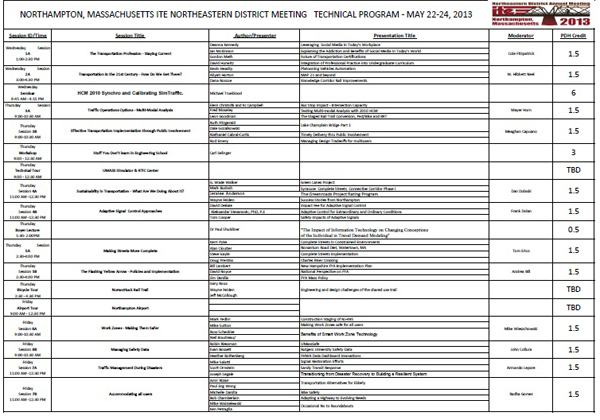 Be one of the first to show your support and commitment to the 2013 Northeastern District Annual Meeting. The deadline for consultant support has been extended to April 1st. Visit the New England Section on Facebook and on Linkedin!